”The day Hitler walked into Norway, I walked into Leger’s studio and bought a wonderful 1919 painting from him for $1,000,” Peggy Guggenheim wrote of her days as a madcap collector in Paris right before the Occupation. For all her audaciousness, Guggenheim was savvy where money was concerned: In 2015, a painting by the same artist fetched $17 million at auction. It’s a classic case of being at the right place at the right time. These days, you can amass a collection of your own without ever getting off the couch—the right place—and without the anxiety of the troops advancing. The buying and selling of art has moved online, and now, the art world can be your oyster with the click of a mouse—often for a reasonable price. We’ve vetted the growing number of online galleries and come up with a short list of the best and most budget-conscious in the business. Services like art consultation, custom framing, and even payment plan options mean that your growing art collection will always stay true to your taste and budget. These guys not only have an eye for good work, but also know their audience of would-be Peggy Guggenheims. Art.com is a veteran in the online art game. An online poster shop when they first landed on the scene in 1998, the company has since reimagined their brand, upped the quality of their selection, and expanded their range of services—in effect, positioning themselves as a veritable online art emporium, 20 years strong. Most recent (and attractive) among their services is their newly launched app, ArtView, which uses AR technology to plot and plan a gallery wall in situ—and sure, they’ll sell you a print or two to round out your hanging project while you’re at it. Etsy, no longer just the handmade tchotchke online marketplace of yore, is now a destination for art. Worry not, there are still plenty of earthy wares to be had on the site, but as a seller-driven marketplace, its offerings are as diverse as the 2,000-plus artists and artisans who have set up shop. 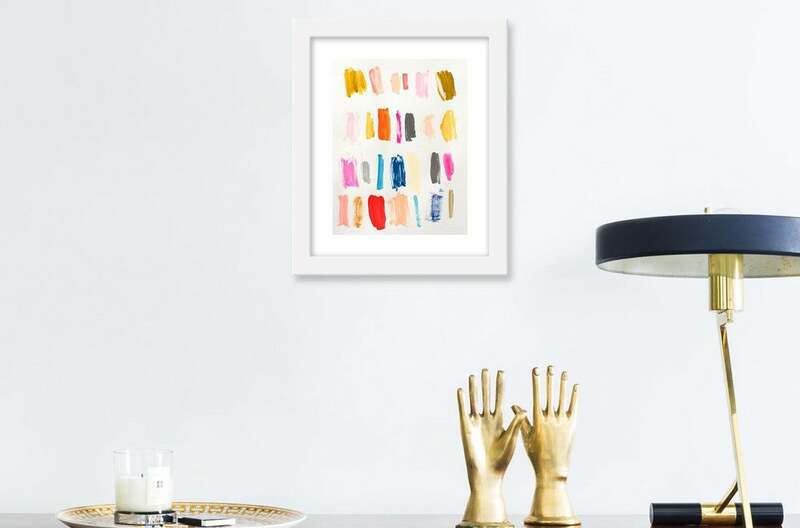 In an online sea of prints and multiples, Etsy’s longstanding reputation as a source for one of a kind, handcrafted goods should come as a breath of fresh air to buyers on the hunt for unique originals. Riding the success of last year’s Chairish Artist Collective—a handpicked selection of work by emerging artists—the online consignment shop for furniture and decor has recently launched The Print Shop, a corner of their website devoted to high-quality prints. Their angle on selling art online? Curation. Answering your questions is high on ArtStar’s list of priorities—you can “Chat With an Art Expert” on the spot and get instant assistance locating the right piece for you, and they’ll even Photoshop it into your space if you provide a picture. Customer service is where ArtStar really shines. Crawford’s background as an art advisor is in evidence here; customers are treated like collectors. Having launched nearly a decade ago, Zatista’s been around the block—and in that time, they’ve perfected the way you can search for art on their website. Their “Art Explorer” feature suggests work you might like based on the items you favorite as you browse. Like many competitors, they offer advisory services, but this unique tool lets you find your own way to the one of a kind piece for you. Wanting to make art accessible to all is what drove founder and CEO Jen Bekman to start 20×200 in 2007. “We want everyone to talk about their art collections with the same level of interest and enthusiasm people bring to conversations about the books they read or the movies they see,” she says. Limited edition prints by Trey Speegle and William Powhida will surely get the conversation going, and you can count on less pricey options to make the same impact where quality is concerned. “From the very beginning, we’ve been uncompromising about quality at every price point. Our $24 prints are produced with the same exacting standards as our $10k prints,” Bekman adds. With names like Richard Prince and Kim Gordon on their roster, you know they mean business. We’re fans of this 2016 Wendy White print featuring former First Lady Michelle Obama—being an edition of just 50, it flew off the shelves. But rest assured that whatever you snag from Exhibition A is a rare, grade A find. A team of curators handpick artists to produce limited edition, museum-quality prints that are exclusive to Twyla—and if their selection is too overwhelming for you, they also offer art advisory services that’ll help steer your collection in the right direction. Uprise Art sets itself apart by specializing in one-of-a-kind originals, rather than multiples and editions—and advisors are on hand here, too. Tze Chun, the company’s founder, explains, “Instead of relying on filtering and sorting like most e-commerce platforms and online galleries do, one of our in-house advisors helps you discover new artists and fall in love with artwork that you may not have known how to search for.” With a tab for “Art Under $800” and even the option for a payment plan, it’s easy and affordable to do just that. With invites and paper goods on offer as well, Minted seems to have cornered the market on all things printed—which is why the art prints are standouts. Customizable in size, framing, and support, they come with the certification that only a specified number will be produced and sold before the print is retired. So, you’re bound to always find new ones to add to your (growing) collection. Artfinder truly acts as an online marketplace, where artists themselves list their works for sale: “No posters, no reproductions, no open editions,” says CEO Jonas Almgren. The result is an overwhelming catalogue of unique works. Although a few filters are in place to help narrow the options down, you’ll find yourself clicking around quite a bit—a worthwhile exercise when you’ve found just the thing you’re looking for. AHA Life’s raison d’être? “The art world has always been notoriously inaccessible, so we’re so excited to see this democratization of the art market. We firmly believe that art is meant to be enjoyed by all,” explains marketing manager Amber Davis. And although AHA Life isn’t solely focused on art, its mission to connect customers to a wide network of artists, artisans, and designers is bound to turn up several one of a kind pieces. Originally published October 2017. Updated March 2018.